Traditional French apple tart is so elegant that I sometimes don’t wanna break its beautiful shape by my greedy stomach. 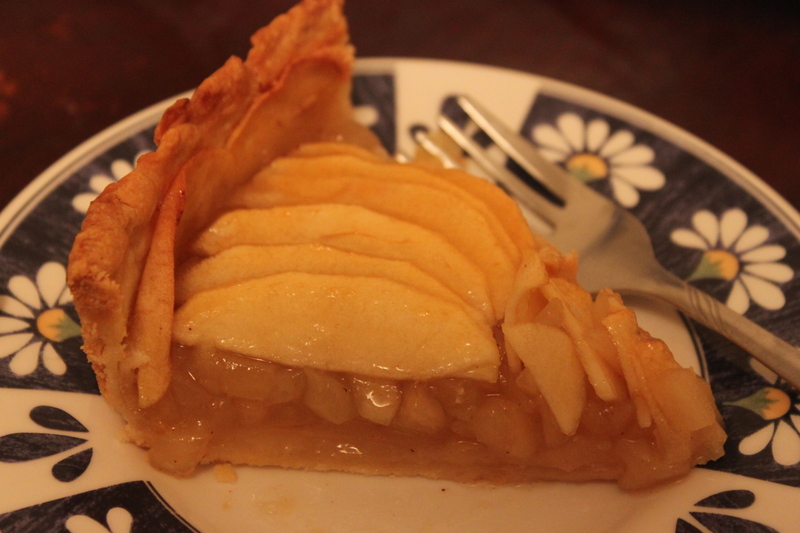 This time I made French tart with all of apples, which are apple compote and rose shaped thinly sliced apple. Eventhough we change the original recipe, I believe the scrumptious taste of this tart still retains as we want our stomach does not upset too much. Provided that it’s apple, the tart is still delicious. The fun thing behind this tart is that I had lots of help from my hubby. It’s March 8th today. He helped me slice the apples, dice those fruits and made the shortcrust. I only had to shape the sliced apples. – Combine everything but the water in a food processor. Pulse for 8 – 10 times or until you have a coarse meal. – Form the dough into a wrapping plastic and keep it refrigerate for at least 2 hours. – Use 3 apples to chop them into small cubes. – In a small sauce pan, combine cubed apples + 1/2 cup water + 1/2 cup sugar + 1/4 tsp nutmeg and bring to a boil uncovered. Keep the pan for 18 minutes uncovered at medium heat. – Slice very thinly 3 apples. – Use a fork to make holes in the bottom of the crust. – Add the apple compote and press it to the bottom of the pan evenly. – Arrange the thinly sliced apples in your favorite shape ( I believe you would do much better than I did). – Bake at 400 F (200 C) in the middle rack of the oven for 15 minutes. Then lower the heat to 350 F and bake for another 15 minutes. – Warm the apricot jam and spread it over the tart to help it keep the shiny face. 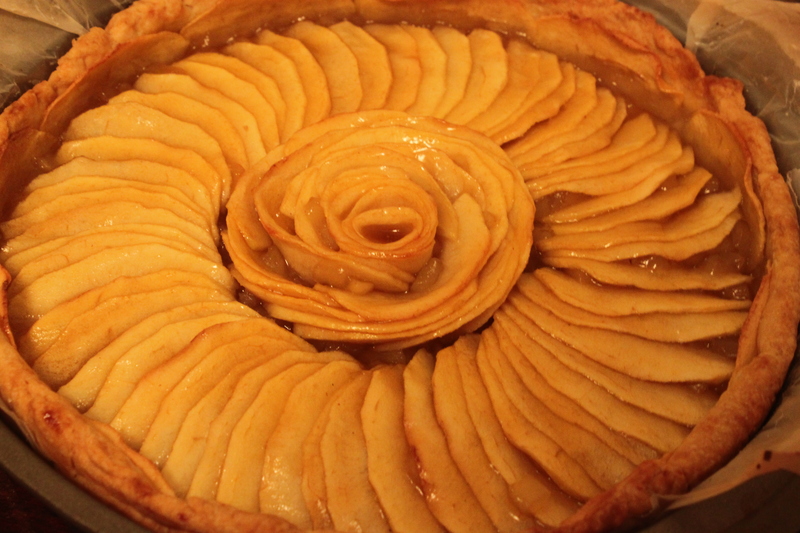 This entry was posted in dessert, French, Tart and tagged apple tart, french tart, tart. Bookmark the permalink.